Over 20 student volunteers helped to collect recyclables for the Aloha ʻĀina Recycling Drive at Nānāikapono Elementary School on October 5. Over 4,000 lbs. of computer electronics, scrap metal, cardboard, batteries and household items were collected that morning. 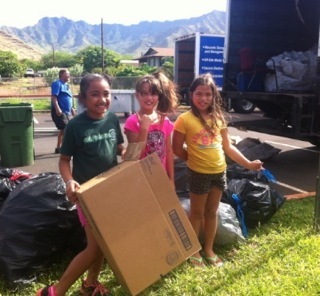 A big Mahalo goes out to the school’s students, staff and Nānākuli community for supporting Nānāikapono Elementary School’s first school campus Recycling Drive. Aloha ʻĀina Recycling Drives offer a great opportunity for communities to support schools' fundraising efforts by dropping off recyclables during these drives. All types of scrap metal, including bicycles and appliances, Hi-5's, computers, cartridges, batteries, used cooking oil, household items and more are accepted. Click here for a full list of accepted items.